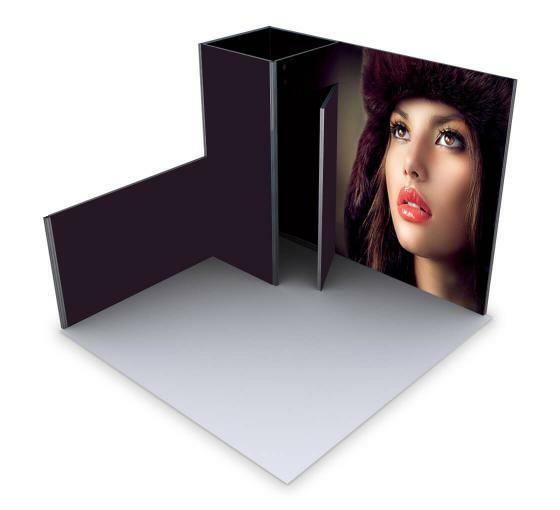 Alpine Booth- Configuration B is a Stylish and Sophisticated Way to Promote Your Brand! If you are introducing a new product or service in the market, but you need spread the word amongst people, you will probably set up a booth at a tradeshow. If not, you may setup a booth at your present your location. The stunning configuration "B" alpine booth will stand out from the rest and will definitely attract a crowd towards you. In fact, its glorious and sleek appearance may serve as an incentive for people to check it out. Our Alpine custom trade show booth design in Configuration B allows you to choose from three options. You can order just the frame, just the graphic, or the entire graphic package. If you order just the frame, you can design it anyway you like. If you think that your graphics will fit perfectly in Configuration B of our Alpine conference booth displays, place your order. Be Creative and Unique with an Option that Attracts People! If you to purchase additional accessories along with your purchase of an alpine booth, you can. When you order custom trade show booth designs, you can select slat walls, shelves, backlit and front lit LED lighting, doors, rooms, backwalls, and more. You want to create a lasting impression so people recall your brand's name and its products and services later on. Our Alpine conference booth displays are a unique and exciting way to promote your brand.